With around 40 amateur and semi-professional musicians, the Sleaford Concert Band is going from strength to strength. Conducted by Richard Joyce, the Director of Music, the band has an extensive library of music journals and perform pieces from almost every genre including classical, big band, jazz, TV and film and light concert pieces, there's something to suit everyone. Over the past 20 years, the Band has won numerous awards for its charity work having raised over £30,000. This includes being nominated for The Queen’s Award for Voluntary Service in 2012 and again in 2018. Although it was unsuccessful, it did get into the last five nominations from the whole of Lincolnshire. The band has also undertaken several foreign tours. In 2000 it visited Marquette-Lez-Lille in France as part of the Twinning agreement with Sleaford. It returned to Lille in 2009, visited Berlin in 2011, Paris in 2013 and Barcelona in 2015. Since then the band has recently visited Belgium and plans are already afoot for the band's 2020 tour to Rhineland, Germany. 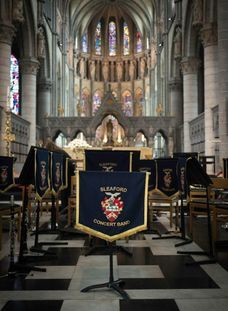 The Sleaford Training Band was formed in 2000 by members of the Sleaford Concert Band who decided that a feeder band should be created to encourage young musicians to learn to play in an ensemble. The Training Band exists to introduce new musicians, young and old, to the special delights of playing in a band. It acts as a proving ground for those not yet ready to join the full Concert Band directly, and is a most enjoyable way to start Saturday mornings. Ken Garfield (Solo Clarinet) was asked if he would conduct the band and Ken has led the band both in rehearsals and in public performances. Initially The Training Band was made up of young people but as time went on more and more adults were attracted to the band and today there is a nice mixture of children and adults. Many of the adults have learned to play a secondary instrument in The Training Band. 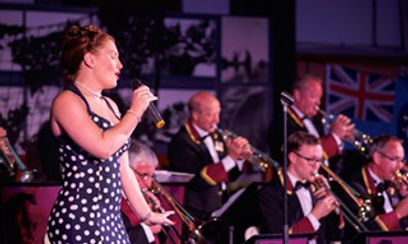 Miller Magic is a 16 piece Glenn Miller Tribute Band which specialises in playing Glenn Miller, Duke Ellington, Ella Fitzgerald and other 1940s/50s Big Band Sounds. The Band was formed in 2013 by musicians of the Sleaford Concert Band led by Jim McQuade and has developed into a very popular and hard working outfit. Over the years the Band has performed at various types of events including Heckington Show, East Kirkby Aviation Centre, Royal Air Force College, Cranwell, EPIC Centre, Lincolnshire Showground, South Holland Centre, Spalding, Baths Hall, ,Scunthorpe Armed Forces Day Events in Sleaford and Grimsthorpe Castle. The Band has proved to be very popular with its audiences. If you enjoy pieces like American Patrol, In the Mood, Little Brown Jug, St Louis Blues, Cheek to Cheek and In a Sentimental Mood then this is the band for you.